Are you looking for a company offering minibus training Southampton that will let you learn at your own pace in a fun environment? You have come to the right place as Wayside Transport has more than two decades of experience in doing just that. If you would like to find out more about our full process for getting licenced as a minibus driver and the prices involved, then please give our team a call at your earliest convenience on 01202 873 911. Regardless of whether you are an individual looking to expand your job opportunities or a company who needs several employees to receive an upgraded certificate, Wayside Transport is the go-to business for minibus training Southampton that emphasises a personalised courteous service and high quality tuition at all times. If you don’t have your provisional licence yet to begin Southampton minibus training, then don’t worry as Wayside Transport will help you with all the forms to get everything sorted so you can start as soon as possible. You will be able to take your test at the Southampton centre at a time that’s most suitable to you once the modules and practical lessons have been completed to satisfaction. Why choose Wayside Transport for your minibus training in Southampton? At Wayside Transport, we have specifically designed our minibus training Southampton courses in a way that trains you or your staff members to the highest possible standard in the most efficient way. You can book your lessons with confidence knowing that all instructors are fully endorsed by the DVSA and have a proven track record of excellence when it comes to first time passes. We would highly recommend all customer whether past, present or potential to spend some time reading through the rest of our easily navigable website for even more information about us as a company and exactly how we have become the number one provider of minibus training in Southampton. Don’t forget to check out our dedicated testimonials page for a selection of feedback we have received over the years from our satisfied past customers. We are beyond confident that if you asked any of our previous clients who the finest provider of Southampton minibus training is, they would not hesitate to point you in our direction. As you can tell from all of the above, no other company offering minibus training Southampton will be able to compete with everything Wayside Transport brings to the table as far as teaching excellence, an amazing pass rate and extremely competitive pricing. Should you have any more questions you would like to ask our team before committing to a purchase, please get in touch using one of the contact methods outlined below. 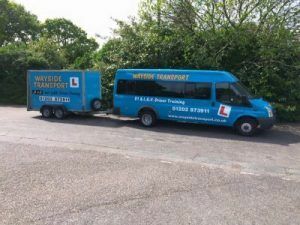 Feel free to get in contact with the friendly team at Wayside Transport absolutely any time to begin benefitting from top of the line minibus training in Southampton. You are more than welcome to reach out by either calling us directly on 01202 873 911, e-mailing your requirements right on over to simon@waysidetransport.co.uk or filling in our simple online request form. We look forward to hearing from you very soon and will always respond to customer enquiries in a timely manner.